This was our first experience using Zicasso and we will use it again from now on! We were uncertain between a vacation in central America and one in Argentina and requested quotes for both. We quickly received very credible responses from four specialized agents. We decided to go to Argentina and after thanking the others we chose a tour company that we found on Zicasso. This turned out to be a holiday of a lifetime. We are a family of four with teenage son and daughter. The Argentina tour company understood our needs quickly and through an easy iterative process via phone and email produced a tailor made itinerary that suited exactly what we were looking for. From then on the process went extremely smoothly as they took care of literally everything and we had to spend no further energy or time on the trip preparation. They were very professional, extremely thorough and once there they followed our every step in an unobtrusive manner yet giving us the peace of mind of knowing that we were in safe hands at all times. All the providers they used - guides and drivers - were chosen carefully ad were always on time, knowledgeable and pleasant. The hotels were good and the tour company even chose the best rooms. Argentina turned out to be an awesome destination and thanks to this travel company it all worked like a Swiss clock allowing us to concentrate on creating wonderful memories. We would recommend them unequivocally to anyone, they represent the essence of what high-end personalized travel should look like. Zicasso is great, we'll use it again! Difficult to choose. 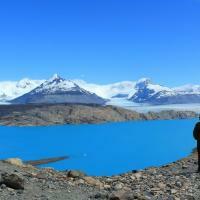 We went to Buenos Aires, Iguazu and Patagonia. Nature there is overwhelmingly beautiful and everything is so unspoiled and natural. We hiked a glacier, went under the waterfalls, walked on an island full of penguins, saw among others sea lions, cormorans, eagles, condors and grey foxes, we went on a ride with sleigh dogs and rode horses without a soul visible for miles.